Purchase Carl Melichar Art Prints online from ArtBarbarians.com located in Minnesota. As a wildlife artist specializing in paintings and prints of hunting dogs, Carl Melichar is different from many other artists not only in his artistic style, but also in his attitude about making his work easily available to his customers. "Early in my career, like many other wildlife artists, I had a choice between finding an agent to market my paintings or to do the marketing on my own," Melichar reflects. "I decided to sell my works myself, not as a means to make more money, but as a way to give my customers more of a chance to buy my art at affordable prices." Among Melichar’s typical stops throughout the year are sports shows (he does a dozen or more of these annually), state fairs (he has had a booth at the Minnesota State Fair for 12 years), the Minnesota Renaissance Festival (again, here he has his own cubicle), Pheasant Forever Fests (he has had a table at each of these four events), and many other places where wildlife artists gather to display and sell their works. 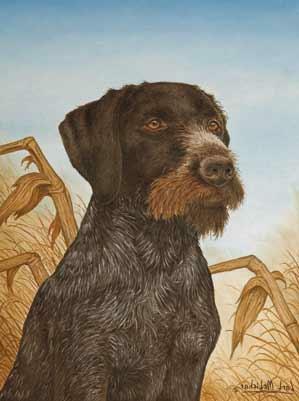 In painting a portrait of any gun dog breed, Melichar starts the process with first-hand observations and photographs. "Though I like to see the canine subject in real life and shoot my own photos, I would just as often have people send me pictures they have taken of their dogs," Melichar says. "No matter who does the photography, I prefer to have many close-up shots that clearly show the details of the dog’s eyes, face, head and body, which means the photographer needs to fill the frame with the entire dog." For anyone taking photographs of a dog, Melichar advises, "Be sure that there is lots of light that will make the dog’s eyes shine and sparkle and that will catch the expression in the face as well as the details of the hair color on the head and body. "I like many photos from several angles so that there are several perspectives available in creating an all inclusive image with a paint brush. 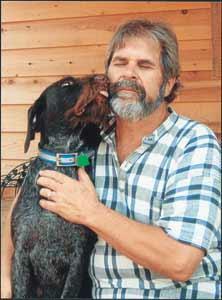 Film is cheap, so use up several rolls as a way of capturing the whole personality and character of the dog." Whether Melichar takes the photos himself or uses those sent to him by his customers, he makes sure dog owners pick a half-dozen or so pictures that they feel capture the most important features of the subject for the painting. "By combining the selected photos, each of which shows some important facet of the dog, I can create a composite image of the dog in the painting. "Identifying and expressing the essence of a subject based on all the component parts found in photographs often is the job of any artist who paints any kind of picture," Melichar believes. "That’s what makes a painting of a client’s dog better than a single photograph of the dog, because the painting is a combination of the best photos and is therefore more revealing and ultimately more complete." "You’re the ‘prince of gun dog prints,’" one of Melichar’s friends once told him after looking at the hundreds of paper reproductions of his original paintings. "I took this as a compliment," Melichar says with a smile. "And I’ll readily admit that prints are the products that make my work popular and affordable," he adds. "I’ve been told by some people in the retail art business that my prints have probably outsold many other artists whose works are sold by many of the major wildlife art dealers across the country." As with the works of many other wildlife artists, Melichar’s paintings of dogs have appeared many other places, including calendars, note cards, coffee mugs, dinner plates, and t-shirts. "These usable objects are a good way to put my dog images into people’s homes and daily lives and have been useful to me in generating interest in commissioned paintings," Melichar notes. 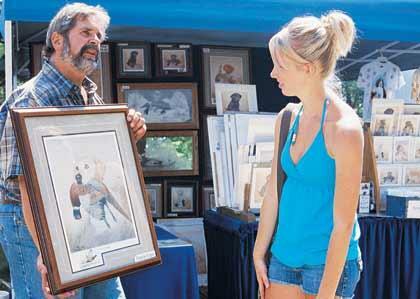 Selling his prints at sports shows, fairs, and festivals has also been a good way for the artist to keep in touch with his customers. "By personally meeting with the buyers of my pictures, I can stay aware of their feelings about my art works. I get some worthwhile insights and information when people talk to me about what they like in a painting or a print. And their opinions are valuable and are reflected in what I produce," Melichar says. Prints made from original paintings are one of Melichar’s many sources of sales at indoor art shows and outdoor festivals. "In these works, I try to portray the main characteristics of specific gun dog breeds in a way that potential buyers can recognize the identifying features of their own Labradors, German shorthaired pointers, Springer spaniels, or whatever kind of dog they have. My print customers know what to look for and what they like when they see a picture of their favorite breed of gun dog and will often say ‘Hey, that looks a lot like our dog,’" Melichar says. Though the general image of the canine in the print may be very close to the particular dog owned by a print buyer, Melichar can also draw or paint a ‘Remarque’ or a miniature portrait of his customer’s dog in one lower corner of the print. "Working from a photo, I can create a unique image of their dog. By doing this Remarque the print becomes more personalized so that the total picture becomes unique and more meaningful for the dog owner as well as the owner’s family and friends," Melichar says. Typical Remarque’s cost from $50 to $75, depending on the time and details involved in their creation. "In most cases, I can finish a Remarque in a week or 10 days or, in special instances, one day if I can fit it into my schedule. "Some people prefer a game birds such as a pheasant or a duck as the subject for the Remarque, which doesn’t take very much time to do," Melichar adds. In his career, Melichar has done thousands of Remarque’s, something many other artists don’t like to do because they often consider them too time consuming and tedious. "I like doing Remarque’s because my customers appreciate them so much and feel that they’re getting some original artwork for a very affordable price," Melichar says. Most artists who specialize in sporting dog pictures are interested in commissioned works in which an individual specifies the subject of the painting and approves of and pays for the final product. "A commissioned painting can cost from $800 to $3,500, depending on its degree of complexity and size," Melichar says. "A simple portrait based on just a rendition of the dog’s face doesn’t take as much time and effort as a full-size view of the dog in a hunting situation with game birds and a landscape in the background," Melichar explains. Some of those who commission any type of painting can also make arrangements to have a series of paper prints based on the original work. "This can provide a less expensive series of images the customer can give away to family and friends. Or the prints can be used as a charitable donation to a non-profit organization with appropriate tax write-off benefits," Melichar says. Another possible opportunity for the person commissioning a painting is to offer a limited edition series of prints for sale as a way to help cover the cost of the original artwork. "This is a popular approach often used to pay for the original painting," Melichar says. "But I always alert my customers to the fact that making prints requires some additional up-front financial investment and usually requires a lot of work and time in selling the paper reproductions." In some cases,Wildlife artist Carl Melichar will form a partnership with the person commissioning the original painting and paying for the series of prints. "In this arrangement, I will help to market the prints and we will share the proceeds. This sort of deal usually works out best because my sales outlets are inexpensive but very effective and all part of my effort to provide affordable art for everyone," Melichar says.